During the hot summer months, Spaniards look forward to their cuisine’s rich array of cold soups and salads. 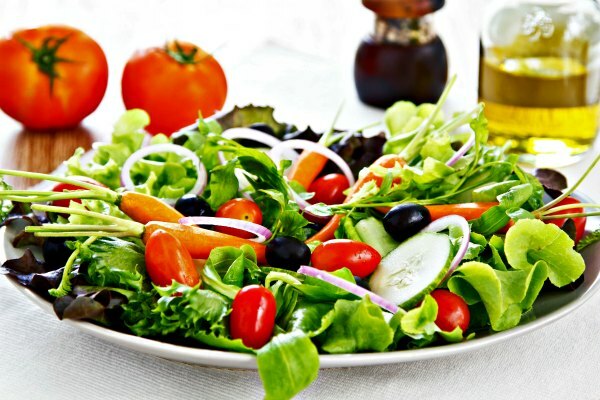 Salads range from uncomplicated combinations to more elaborate compositions. 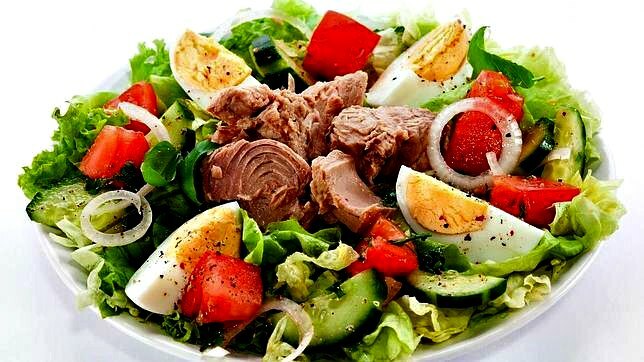 With the exception of the seasoned lettuce or escarole leaves that usually accompany roasted lamb or goat, salads are served before the main course. 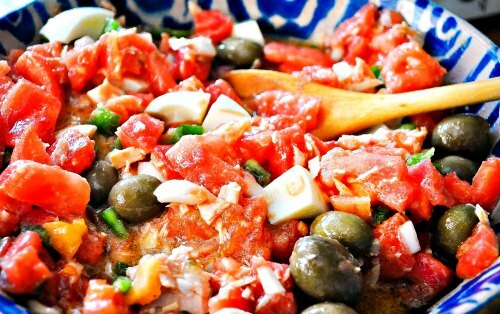 Ensalada mixta, a simple mix of lettuce, tomatoes, and onions, is common to all regions and also serves as a base to which hard-boiled eggs, potatoes, tuna, and/ or olives are added. Specialty ingredients such as salt cod, baby eels, avocados, asparagus, cheeses, or roasted red bell peppers give more complex salads their regional character. One of the most distinctive preparations is Catalan xató, which combines escarole, salt cod, tuna, and anchovies and tosses them with a picada, a classic sauce of the region made from dried red peppers and hazelnuts or almonds, or both. Not surprisingly, salads made with citrus begin many meals in orange country— Valencia and surrounding areas— while the frequent use of cheeses such as Cabrales in Asturian salads arises out of that region’s venerable cheese-making tradition. The key to making good cold soups and salads is to use only the finest and freshest ingredients. Tomatoes, in particular, should always be very ripe. If you must postpone making a gazpacho or salad because the tomatoes aren’t ideal, do so, or you will be disappointed. Properly dried greens is another salad essential. Excess moisture will make a salad wilt more quickly and will dilute the dressing. Ensalada mixta: Numerous variations on this pleasing salad are found across Spain, with such additions or substitutions as preserved white asparagus or green bell peppers. Apple and Walnut Salad: This refreshing, crisp summer salad provides the perfect accompaniment to a glass (or two) of chilled Spanish sherry. For a tangier version, add a dash of lemon juice to the mayonnaise before mixing it into the salad. Endive Salad with Cabrales Cheese and Oranges: Cabrales is a spectacular blue cheese from Asturias that is famous throughout Spain and is becoming better known abroad. Salty and intensely flavored, it is a treat whether served alone with bread and cider or wine or added to a salad, as in this recipe. 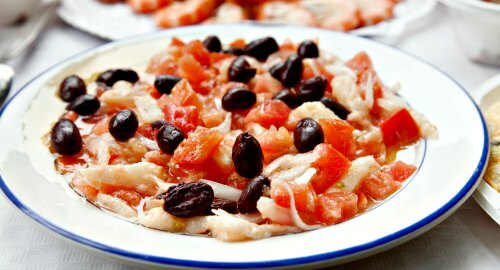 Esqueixada is a quintessential Catalan salad (esqueixar is Catalan for “to tear”). The main ingredient is always cod. Some versions also include green bell peppers; others eliminate the peppers altogether. I make mine with red only. Red Onion and Orange Salad: This popular and colorful salad lends a festive note to any tapas table, and is featured in many tapas bar throughout Spain.